The Tokyo Gas Group sets targets for each materiality of its CSR activities through its business and seeks ongoing improvements. Key CSR activities and materiality are revised each year based on a review that incorporates stakeholder comments. Up to fiscal 2017, we promoted our CSR activities under the main policies for fiscal 2015–2017 for realizing our Challenge 2020 Vision, pursuing key CSR activities determined to meet social demands and expectations, and priority issues (materiality). ■Comprehensively identify the issues by consulting the GRI G4 Sustainability Reporting Guidelines, GRI sustainability reporting standards, ISO 26000 and other relevant international guidelines on the social responsibilities of organizations as well as the SDGs and other social needs. 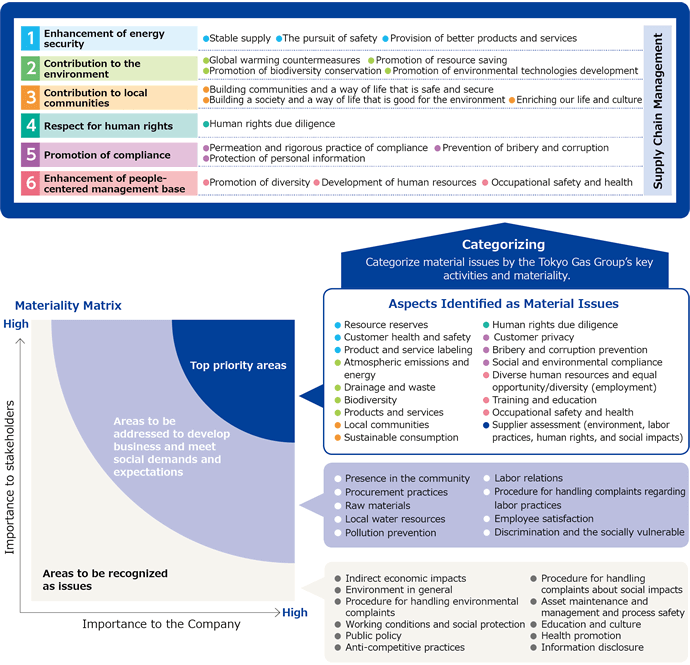 ■Determine the level of impact associated with CSR-related social issues based on the business characteristics, strategies and scope of impact of each stage in the Tokyo Gas Group’s LNG value chain and narrow the issues down according to their material aspects. ■Examine the material aspects identified in Step 1. Assessment of stakeholder perspective based on questionnaire findings and other feedback. Determination of provisional priorities by relevant business departments. 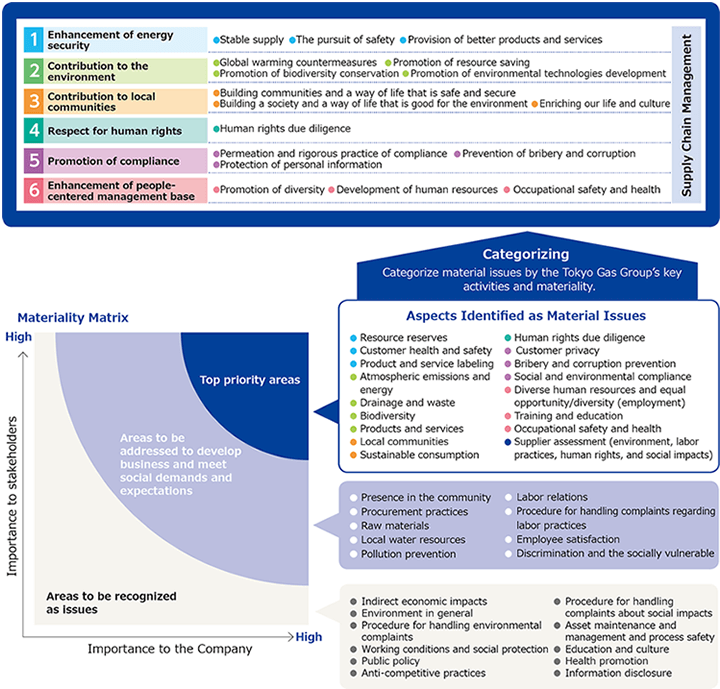 ■Map the results of the materiality assessment from the perspectives of stakeholders and the Tokyo Gas Group. Identify the material aspects to be addressed by the Group on a priority basis through internal consultations. ■Confirm the validity of material aspects that were identified based on an assessment by experts in relevant fields. ■Review the Group’s key CSR activities and define the materiality of each activity based on its material aspects. ■Finalize materiality by obtaining approval from the Corporate Communications Promotion Committee, the body driving CSR. ■Work with relevant business departments to determine targets (“CSR KPIs”) corresponding to the materiality identified through the process. ■Assess activities with respect to materiality based on CSR KPIs and disclose the results in the CSR Report. ■Conduct a review for each fiscal year based on the results of internal and external questionnaires, views of outside experts and SDGs and other international goals and guidelines. ■Utilize the results to review materiality and CSR KPIs toward incorporating them into business and improving the quality of reporting. In October 2017, we formulated the Tokyo Gas Group FY2018-2020 Medium-term management plan GPS2020, which led to identifying our new materiality. Starting in fiscal 2018, our PDCA cycles will be driven by assessing and improving initiatives based on our new materiality. We categorized our materiality into strategic issues and fundamental business issues. We repositioned governance and compliance into our management base. We determined the relevance between our materiality and the SDGs to which the Tokyo Gas Group contributes. 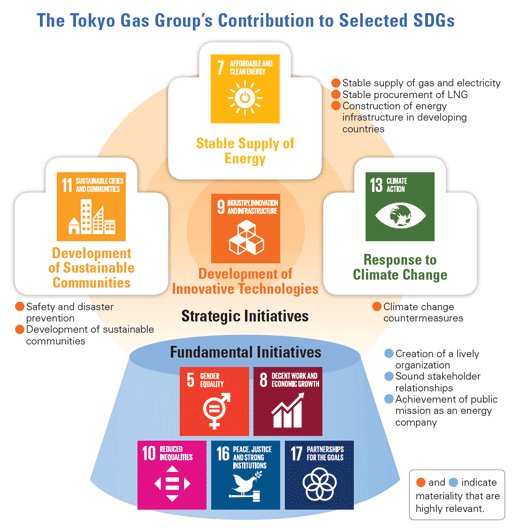 The Tokyo Gas Group will focus on SDGs 7, 9, 11 and 13 through its strategic initiatives, and SDGs 5, 8, 10, 16 and 17 through its fundamental initiatives. We will contribute to the SDGs through CSR management by determining their relevance to our new materiality. *1 Energy consumption per unit of gas produced. *2 Energy consumption per unit of gas sold. *3 Energy consumption per total floor area. Chief Researcher, Daiwa Institute of Research, Inc.
“Stable supplies of energy” is a significant key phrase for the Company’s business, and “disaster” and “accidents” are aspects of particular concern to consumers that require special attention when considering materiality. While not generally well known, the ability of Tokyo Gas to deliver a stable supply of energy is supported by measures for dealing with earthquakes and preventing gas leaks and explosions. The Company should recognize these measures as a corporate strength and incorporate them into its materiality. It could also focus on its ability to combine the use of district heating and cooling systems, solar-based thermal energy and smart meters to supply stable and clean energy to cities and local communities as another strength. By supplying gas to consumers, Tokyo Gas directly supports bathing and cooking as well as housekeeping and parenting in general. In this regard, the Company could encourage male employees to take childcare leave, for example, as it may lead to the secondary benefit of discovering potential customer needs and developing new business. Breaking away from gender stereotypes in daily life may ultimately benefit the Company’s business. Tokyo Gas is uniquely positioned to support diversity within its own organization as well as across society as a whole. Another promising idea is to add “food education” to its materiality. “Sustainable procurement” is a key phrase of the Olympic and Paralympic Games Tokyo 2020. As an Official Partner, Tokyo Gas should work to enhance sustainability and traceability in procurement for the Games. One example would be to secure an appropriate working environment for staff involved in construction work and services as part of its supply chain management in Japan as well as from the standpoint of human rights. From here on, Tokyo Gas will be expected to move beyond identifying and disclosing its materiality to incorporating it into its management strategy and medium-term plans. Natural gas has a competitive advantage as a low-carbon source of energy compared to coal or oil, which are currently in the international spotlight. However, the Company must present its vision of how it will remain in business when society begins to demand zero-carbon strategies after 2030. As for SDGs, the Company should do more than simply linking them to its materiality; it should instead pursue initiatives focused on the outcome, the positive impact on society of its business activities. There are three stages in pursuing SDG initiatives: (1) Identify the linkages between existing corporate initiatives and the SDGs; (2) Compare the Company’s materiality issues with the SDGs and consider the business opportunities; and (3) Recognize the SDGs as social issues and reflect them in the Company’s business activities and management. Linking business activities to the SDGs only for the sake of creating the appearance of contributing to them is called “SDG washing,” which is certainly not appreciated. The key is to demonstrate the Company’s level of contribution to the SDGs in terms of social impact. I have great expectations for the future efforts of Tokyo Gas. While a world without poverty is an essential goal of the SDGs, most of Japanese companies have not yet addressed this aspect. Many people are oblivious to the level of poverty in Japanese society, which is in reality a widespread and serious issue. I would like to see Tokyo Gas at least indirectly contribute to the goal of eliminating poverty by considering ways to respond strategically to the 169 targets and offering ideas for business solutions. It is important that top management is committed to materiality issues and the SDGs. Indeed, in its Charter of Corporate Behavior, Keidanren (Japan Business Federation) strongly encourages top management involvement in the SDGs. What is also important is having a vision of the Company in 2050. There is currently little movement in this direction in Japan, but even so, I recommend that Tokyo Gas begin considering this point. The future vision and goals to be disclosed to the public need not be viewed as binding targets. It is more important to have the policies and spirit of challenge toward attaining the Company’s ideals. “Preventing environmental accidents” and “ensuring safety and preventing disasters” are especially important for materiality. Safety is a value, and security is an asset. Gas explosions and leaks will have a major impact should they occur, and significant effort is required to prevent such explosions over a long period. The efforts made by Tokyo Gas and its expertise on training staff, developing safe appliances, educating consumers on how to use gas appliances and conducting inspections are all Company strengths. Bribery and corruption are frequently cited CSR issues associated with the supply of energy in developing countries in Southeast Asia and other regions, so the Company is advised to disclose more precise information disclosure on preventive measures. Engagement with local residents is important for entering the Southeast Asian market. The Company should start by listening carefully to local voices and intensify its CSR efforts in its overseas projects. It may also be useful to further disseminate the CSR mindset of the Tokyo Gas Group among its employees. On the subject of risks associated with water, while it is the norm in Japan to use seawater for indirect purposes such as cooling, other countries more commonly use freshwater. Although we may take it for granted the use of seawater actually helps limit the use of freshwater, and as in this example, there may be ideas the Company could introduce overseas. In regard to SDGs, it seems to me that many Japanese companies confine themselves to the superficial gesture of simply linking the 17 Goals and 169 Targets to their own business activities. It would be better for the Tokyo Gas Group to identify and communicate what it can do to achieve the fundamental principle of the SDGs: leaving no one behind. For example, it would be effective to send a message that connects the perspective of universal access to energy with GPS. As deregulation in the electricity and gas markets progresses, I believe that maintaining the supply of energy even to regions offering little profit in terms of business would be one way to fulfill the social responsibility for achieving the principle of leaving no one behind.